Danielle MacDonald is a Registered Nurse who is currently enrolled in the Master of Nursing Program at Dalhousie University. She is passionate about maternal, newborn, and child health globally and has a specific interest in midwifery. Danielle is grateful for funding support received from the Dalhousie University Global Health Office which enabled her to attend the The 21st Canadian Conference on Global Health this year. What follows are Danielle’s thoughts and insights from her time at the conference in Ottawa. 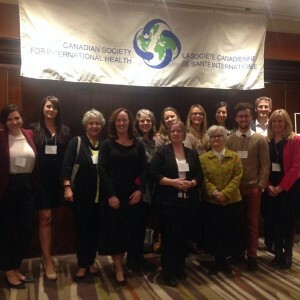 This is Part 4 in our blog series highlighting student perspectives from the Canadian Conference on Global Health. The conference participants were composed of students, researchers, clinicians, educators, NGO representatives, government officials, representatives from the private sector, and funders. The varied perspectives of the conference participants provided the foundation for stimulating discussion and debate. Throughout the conference, it was interesting to hear about the strengths of some partnerships and the challenges that many partnerships have faced in the pursuit of improving health globally. Several common challenges that were identified in many partnerships were: communication, the time required to establish respectful partnerships, competition, and differing perspectives. In a break-out discussion for one session I attended, we discussed how documentation of the process of partnering between various sectors could benefit others in various stages of partnership. Reflecting about the partnership process, and documenting those reflections, could provide a valuable resource for creating and maintaining sustainable, inclusive partnerships amongst all sectors. This discussion left me with a feeling of optimism that various sectors can create respectful partnerships with each other, united by the common goal of improving health globally. Representatives from Dalhousie University at the Canadian Conference on Global Health. Ottawa, 2014. I would like to take this opportunity to thank the staff of the Global Health Office for the encouragement and support they provided to the Dalhousie students who attended this conference. The conference offered a perspective of the contributions being made to global health by Canadians and their partners throughout the world. It was a fantastic opportunity to learn with and from Dalhousie colleagues and to connect with colleagues from across the country and the world. Thank you for the opportunity to engage in another excellent inter-disciplinary global health experience! If you haven’t done so already, we invite you to read Part 1 Part 2 or Part 3 of this series. To find out more about Global Health at Dalhousie please visit our website.